In an earlier post I demonstrated how you can use your shadow to identify swing issues. One of the issues was a "sway" in the backswing. A sway happens when your weight shifts outside your back foot on the backswing. This can be caused because you are sliding your swing center too far away from the target as you start the swing. The mis-hits caused by a sway are either hitting too far behind the ball or hitting it to the right (for right handers). In this video I have provided you a great drill to help you eliminate this fault in your swing. I recommend using an 8 or 9 iron for this drill. Spend at least 15 minutes performing this drill before removing the ball from the back foot. Try to keep the same feel of the back leg restriction when hitting balls. The first cold snap of the season has arrived and us thin blooded Texans head indoors. Sure, we will be back on the course in a couple of days, but as I get a little more experienced, the temperature has to begin with at least a "5" for me to venture back on the course. So, as we approach the off season, this is a good time to discuss how to develop, maintain and strengthen your golf swing. In fact, you should not wait until the off season, but should work on these things I am going to introduce to you year around! Besides doing a few stretches and core strengthening exercises, I use training aids to help me stay in better golf shape. There are many on the market, but these are just a few which I have used and find valuable. If used properly, all of these training aids will help strengthen your golf swing and provide you increased clubhead speed. If you have any physical or health issues which the use of these training aids would effect, be sure and consult with your doctor before using. You can find product information and video about the use of this product on sklz.com. The Gold Flex is not heavy so it is easy on the joints. It has a standard golf grip, the shaft is super flexible and is 49" long. There is also a ladies and junior version available. You need a high ceiling and plenty of clearance to swing indoors. The Gold Flex is not used to hit balls and is excellent for tempo training. Swinging this will provide you a core muscle workout and it really helps you with starting the downswing with the lower body. I like to swing it as a warm up before a round so I carry it in my bag at all times. This item can be found on sklz.com as well. ﻿I really like this training aid as you can put it on any club and either swing indoors or hit balls with it attached (by velcro) to any club. I usually use this on a mid or short iron to work on tempo or to loosen up before a round. It is also good to help you build your strength and flexibility. The Power Sleeve is not too heavy, but does have enough weight so you can really feel how the hands and wrists work in the swing. I use this quite a bit during lessons. Information and video about the proper use of this club can be found on momentusgolf.com. I have used the Momentus training clubs for years. I have both a driver and iron which I swing on an occasional basis. The ones I have are not used for hitting golf balls, but I understand they now have a driver which can be used for practice. They also have many other strength and training aids on their website. The one thing I like about the Momentus is it allows your to put the club in the "slot" on your downswing. These clubs are fairly heavy so if you tend to come "over the top" on the downswing you will really feel it. That's right, a common broom you have in the house makes a great training aid! I prefer the ones with the smaller handle as it is easier to swing and not as heavy as the normal wooden handled broom stick. The resistance you get from swinging a broom will help strenghen your golf swing. I like the broom because it also helps with the concept of "sweeping" the ball off the tee with a driver. I promise you will not swing the broom to upright. You swing will feel more rounded which is good for the longer clubs. Let me know if you have any questions about the above training aids. It never hurts to be a little stronger and a little more flexible so we are closer to the green with our second shots! The is a great swing drill which will develop, enhance or maintain the swing for the beginner to experienced golfer. For best results, perform the drill 3-4 times per week and spend about 5-10 minutes each session. This drill is best done indoors in front of a full length mirror. You need to see what you feel so you will be better prepared to take it to the range, then to the course. 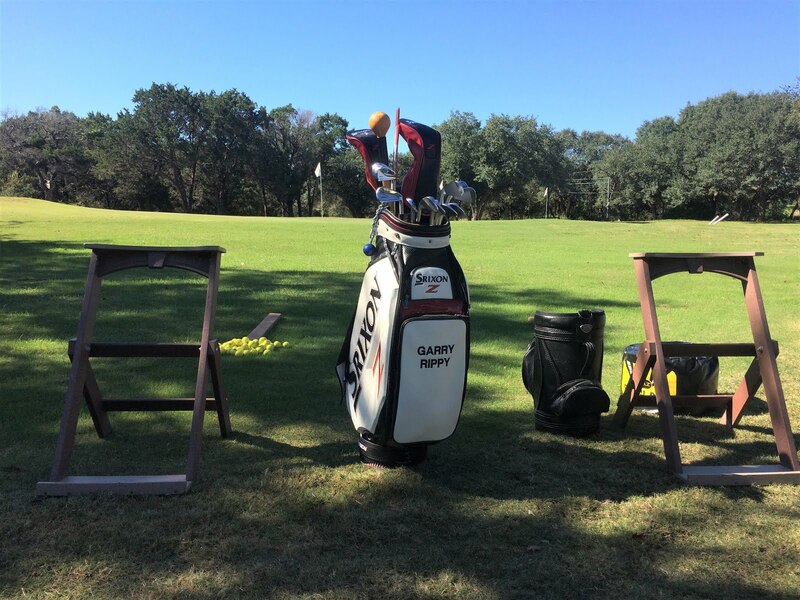 Once on the range, perform the drill a few times working on the parts. Then, using a 7 iron, tee the ball about 1/2" high and hit balls utilizing a full swing, but swing at about 1/2 your normal speed. Focus on the 4 key positions...take away, backswing, impact and follow through. Swinging at a reduced speed will help you get all the parts in sync. Strive for quality in each position. Now try to hit full shots at normal speed. I would hit a few balls off a tee at first and then move to the turf. Many times during a round of golf the sun peaks out from behind the clouds and casts your shadow over the ball while you are trying to swing. You try to focus on the ball, but that darn shadow keeps your attention like nothing else! But I have to let you in on a secret...your shadow is one of the best training aids you own! It may be bothersome on the course, but let me show you how to use your shadow to your advantage when you are on the practice tee. If you don't have your video camera or a full length mirror handy, your shadow will provide plenty of information. All you need is an alignment rod (or club) and a little imagination. ﻿﻿﻿﻿﻿In the following "shadow" pictures the sun is directly behind me and I am facing my shadow and the target is to my left. In the picture on the left, I have placed the alignment rod on the ground in the middle of my body as a reference point. The picture on the right demonstrates how a great backswing would appear. As I swing the club back I let my right side turn out of the way so my left shoulder can move behind the alignment rod. Note how you can see the divot to the right of my body at set up and backswing. This indicates I have "coiled" properly into my right side. Now I have the alignment rod lined up with my right leg at address. On the backswing you can see how my right leg maintains it's position and flex as I "coil" properly. From left to right, these pictures depict TILTING, SLIDING and SWAYING on the backswing which is incorrect. Any of these positions will cause you loss of power and accuracy. Do not copy these positions!! This is how your backswing would look if your converted the "shadow" to HD and view it face on. I have used three alignment rods to get in the correct backswing position. I placed one rod on the ground just inside my right foot, one rod is placed through the belt loops on my pants and I am holding the third rod on my shoulders with my left hand. This leaves the right arm to swing freely. The goal of the backswing is to turn your shoulders so the rod on your shoulders is parallel to the rod on the ground. If you do this, your shoulders will have turned 90 degrees from set up to backswing and your hips will have turned about 1/2 that much. As you do this, make sure to maintain the position of the right leg as I have above. Remember there is no slide, sway or tilt on the backswing. I recommend practicing your backswing in front of a full length mirror every day. Use the picture above as a reference. Remember you don't need a need a club to do this. When you go to the range or even the backyard, use any club and copy the "shadow" pictures... because "The Shadow Knows"! The Short Game is Where you Score! The short game is one of the most important parts of the game. It's where you score! After watching the video be sure and take a look at my short game offerings under Rates/Programs. Any of these programs would make great Christmas gifts for family, friends or maybe a little something for yourself. Call (512-306-5805) or email me (ripone@pga.com) to purchase and I will be happy to send you a certificate via email. Watch this video to see how a bungee cord can improve your swing. 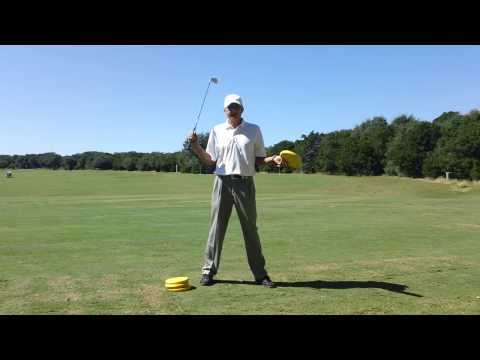 The cord can be used with any club in the bag although I used a driver in this video to demonstrate how using the cord will help you rotate more efficiently and sweep the ball off the tee. This is a great training aid to use for your irons too, particularly if your divots are too deep. When using the cord with irons, I recommend using a 7 iron and tee the ball up about 1/2". Perform the drill as described with the driver and you should start "clipping" the ball off the tee with your 7 iron. If you are having issues with your short shots which would include chipping and short pitches, then this is the drill for you. When I say issues, I mean hitting most of your short shots either thin and blading them across the green, or hitting behind them and not even getting on the green. These shots can usually be traced to an improper use of your wrists. If you allow the lead wrist (left wrist if you are right handed) to break down, as mine has in this picture, you are asking for trouble. I drew a blue line as a reference and you can clearly see my hands and the club head are past the blue line after impact. The break down happens when the lead wrist is bent and the back wrist is straight at impact and after. A common term used for this would be "scooping" which means the golfer is trying to help the ball in the air. To alleviate this problem, I have a great drill which will not only help your impact for the short shots, it will help your impact for the full shots as well. For the drill, I use my most lofted wedge (58 degree). Find an uphill slope with enough room to carry the ball about 10 yards. It does not necessarily need to be around a green. Place the ball on the upslope, then set up with a narrow stance and position the ball off your back foot. Make sure your hands are ahead of the ball at set up. In addition, try to lean into the hill a bit. In other words, I want your weight to be more on the front leg. In the picture above, the blue line runs down my left arm to the ground. My hands are ahead of the ball and positioned toward the middle of my left leg. The ball is obviously behind the blue line. Your backswing should be only big enough to carry the ball about 10 yards or so. There will be a slight wrist hinge on the backswing as pictured below. The trick is try to strike the ball an instant before striking the turf. This is where the upslope will help you. The upslope will not allow you to follow through. It's almost like you are striking a wall. Once you strike the ball, the upslope stops the club so you cannot break down the lead wrist. If you truly strike the ball first, you will hit a very crisp shot. In the picture below, you can see just after impact, my hands are in front of the blue line and the club is still behind the blue line just as it was in the set up position. This is my finish position, the lead wrist is straight and the back wrist is bent. Look how high the golf ball is in the air and I have not "helped" it in the air. Here is a picture from behind me in the same position. Note how low the club is to the ground. When you are performing this drill properly, your shots will improve instantly. If you are still having problems doing the drill, make sure the ball is in the back of your stance, strike the ball first and finish low. Once you can hit the majority of your shots crisply, then move to a level surface and try to feel the same impact you just worked on. Your issues should be resolved after only a few minutes on the slope! Let me know if you have any questions about this drill in the comment section below. 1. Playing from a tight lie within 10 yards of the green with the pin cut close (within 20'-30'). 2. The ball is sitting in a sand filled divot. 3. The turf is very soft. 4. Playing from overseeded turf. Rye grass is very sticky. By using the hybrid, you virtually elimate any chance of hitting behind the ball and taking a divot. It is very important to treat the shot as a putt and not a chip. With just a little practice you will learn the amount of swing needed to get the ball to roll on the green. This is a great drill to help you with your greenside bunker shots. First, draw two lines in the bunker perpendicular to the target about 4 inches apart. I use the bunker rake as shown to make my lines. Lay the rake in the bunker and then step lightly on it to form the lines. After you draw the lines, place 4-5 golf balls in a row about 4 inches apart between the lines. Leave room to make several practice swings before hitting the balls. Set up with the lines toward the front part of your stance as shown. The divot your created in the sand should be a little bigger than a dollar bill and it should extend through both lines. I will demonstrate the drill in the following video. Enjoy and let me know if you have any questions. In putting, your length of stroke and speed of stroke are key elements in controlling your distance. This video explains how a metronome can help you sync these two elements. These are two great drills designed to help your backswing and impact to follow through. Enjoy and let me know how they work for you! Are you Swinging the Club? With all the modern technology at our hands, sometimes I think golfers (including me) get too technical with our swings. We try to be perfect in our swing positions and we forget it is a golf "swing", not a "put the club in the correct position" move. Have you heard the term "paralysis by analysis"? You have to exhibit some tempo and rhythm when you swing and I have found by improving these two areas, golfers tend to improve their swing shape as well. Tempo is the pace of your swing and rhythm is the proper sequence of motion in your swing. You have to find the correct tempo for you that allows all the body parts to move in the correct sequence. If you watch the pros on TV, you will notice their swings look effortless. They swing so smooth yet hit the ball a very long way. They accomplish this through proper sequencing. As an instructor, I see many students that swing so fast they do not get to the top of the back swing before racing down. I would say for every golfer that swings too slow, there are a thousand (or more) that swing too fast! Using these two Champions TOUR players as examples...Fred Couples appears to swing at a much slower tempo than Nick Price. Yet they both have tremendous club head speed because they move their body in the correct sequence for them. We are all different and live life at varying speeds. The bottom line is you just have to have a speed that allows your swing to work efficiently. The importance of sequencing in your swing can be confirmed by tossing a ball underhanded. Let's say you are right handed and want to toss the ball about 30 yards. If you just used your right arm with no footwork, it doesn't feel very coordinated. Now face the target, take a small forward step with your right foot and as you take a step with the left foot let the right arm swing back. What you will find is the left foot will hit the ground prior to the right hand releasing the ball. You will then finish with all your weight on the left foot and on your right tip toe...sounds like a great golf finish to me. If you tossed the ball first, then the left foot hit the ground, you would definitely be out of sequence and not make a very pretty toss. I am a firm believer being in the correct position is very important, but sometimes you just have to let go of a thought process and swing the club. Give these two drills a try and then hit balls from a normal set up. Focus on swinging the club and not trying to put the club or your body in any certain position in the backswing. But, do try to finish your swing in balance and imitate the finish position I am demonstrating. Demo days can be overwhelming! There will be many vendors with literally hundreds of clubs just waiting to be hit. I get excited just thinking about all the extra distance I am going to find from the hottest driver! This article will hopefully keep you from getting buyers remorse. I will provide some information which will keep that new driver or set of irons in your bag for the long term. The problem is all the equipment is good. I suggest you do a little homework before you attend. Go online and look at the vendor's websites. This will at least provide you with some basic knowledge and maybe narrow your list of clubs you want to try. There will also be plenty of reviews online. Read those but do keep an open mind. Let's discuss drivers first. As a demo day rep for Nike for two years I quickly discovered that golfers are usually most interested in hitting the driver first. Now, do not just go to the vendor tent and start hitting without talking with the representative. Nike had over 40 shaft selections and this is probably the most important part of the club. I can almost guarantee the first club you grab will not fit your swing. The demo day reps are highly trained and will help you choose the correct driver and shaft combination. You must have the correct loft, shaft flex, shaft weight and shaft torque to maximaize your distance and accuracy. To help me become a better club fitter, I would try all the shafts and it was amazing the difference. Since most demo days last for 3-6 hours, I recommend spending quality time with each vendor. I think most reps should be able to get you in the correct shaft in a matter of minutes. Once you get the correct shaft then you can start making the clubhead adjustments that are now available. THIS IS THE MOST IMPORTANT INFORMATION I CAN GIVE YOU...do not base your driver decision on the one shot you really hit well. It's not about the "one" shot, but it's about what your "misses" look like. If the misses are short and way off line, this is not the club for you. Be sure you have your driver with you so you can really determine if the new driver you are trying is indeed better than what you have. Once you hit them back to back you will know. If looking for hybrids or fairway woods, repeat the process. You might find you need to go to two or more demo days before you make your final decision. If you are in the market for new irons be sure you get properly fit. You must have the correct length, lie and shaft flex. It was a benefit that I was an instructor when fitting clubs. I found when fitting irons I had to get the golfer in the correct position first. Once the golfer is set up properly I could better determine where to start with length and lie. Once you get the right fit, it is really personal preference if you want steel vs. graphite shafts. Graphite is lighter than steel but they are making some very good lightweight steel shafts now too. For irons, think more of accuracy than distance. One thing to keep in mind for some models of irons, the manufactures are making the lofts much stronger. Just because the #7 is on the bottom of the club, the loft could be that of a 6 iron. Obviously you are going to hit it farther, but do you hit it straighter? Again, spend a little time with each vendor and choose the iron which will help you hit more greens in regulation. Wedges seem to be on the radar now. If you are not carrying at least three wedges you are limiting your shot selection around the green. In actualality you need four wedges if you include the pitching wedge which comes with the set. You need to determine the loft of your pitching wedge before you decide on the other wedges you need. I like to keep the loft difference between my wedges consistent. For example, if your PW is 47 degrees in loft, I would recommend lofts of 50, 54 and 58 for your next three wedges. If your PW is 48 degrees in loft you might go to lofts of 52, 56 and 60 for your next three wedges. The most common problem is most golfers carry a PW of 47 degrees and a sand wedge with 58 degrees of loft. With a difference of 11 degrees, you are very limited in your shot making. Once you decide which lofts to carry, you have to decide which bounces will need. If you look at the imprints on most wedges there will be two numbers. For example you might see 58/10. The 58 is the loft in degrees and the 10 is the bounce in degrees. Just to keep it simple, if you play off firm fairways and firm sand, you are usually better off with less bounce. If you play on soft turf and fluffy sand, more bounce is better. With a little experimentation you will see which works better for you. Good luck with your decision process and I hope this information helps you. Please leave a comment if you have any questions. Controlling your ball around the green is the best way to save shots. It's all about choosing the correct technique and club which will give you the best success consistently. You have two choices when hitting shots from around the green. You can either go high, or you can go low. Going "high" means you are going to hit a standard pitch shot. Going "low" means you are going to hit the pitch and run shot. I will always take the low route when possible as this is a safer shot due to the minimum amount of swing needed. I am going to explain the difference in a standard pitch shot and a pitch and run shot. I think you will see from the pictures when to pitch and when to pitch and run. A pitch shot is used when you need to carry the ball all the way onto the green and then have very little roll. This shot is most handy when you either have to carry a bunker, or the hole location may be near the edge of the green and there is no other way to get to the hole but go high. This shot requires you to use your most lofted wedge and I recommend you carry a wedge with at least 56 degrees loft. Any wedge with a loft of 56-60 degrees will be best. 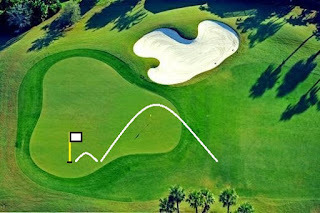 As you can see in this photo, the pin is located near the edge of the green so you have to hit the pitch shot. The main focus for the pitch shot is to let the wrists hinge upward on the backswing, and then re-hinge on the forward swing. At the bottom of the swing, you will clip the ball and turf at the same time. I highly recommend taking a practice swing and try to clip the turf. I have found it works if you "hear" the shot. In other words, when you take your practice swing, listen for the club sweeping the turf. Then, when you hit the shot, try to emulate the sound you just heard. You will know immediately if it sounds correct or not. When you think of sound instead of technique, there will be less thinking and your shots will be improved. The pitch and run shot is best used when you have some green to work with. In this photo, the hole location is in the middle of the green and there is no reason to fly the ball deep into the green. The pitch and run shot is much more safer as there is less swing and follow through. The goal is to land the ball about two steps onto the green and then let it roll to the hole. For this shot you club of choice is a wedge with 50-55 degrees loft depending on how much roll out you need. The less the amount of loft on your wedge, the more roll you will have. Here are a couple of pictures of the proper technique for a pitch and run. The backswing and follow through are much more compact. There is very little wrist hinge on the backswing and none on the follow through. The goal is to strike the ball first then the turf just as you would for a chip shot. There is one more significant difference in the two shots...the ball position in your stance. The ball position for the pitch shot is slightly in front of center and the position for the pitch and run is off the big toe of your back foot. A question which might arise is what is the difference in a pitch and run and a chip shot? For the most part, a chip shot is for shots located one to three steps from the green. The club of choice may be a five iron through a pitching wedge depending on how much roll out you need. A pitch and run is used when the ball is located four or more steps from the green. The maximum distance for a pitch and run could be seven to eight steps from the green. Any longer and a pitch shot is probably the best choice. To become a well rounded golfer you must have an arsenal of shots which fit the situation! Try to spend at least half of your practice sessions hitting these type of shots.